| Genes exist in different versions called alleles. .and a different allele codes for wrinkled seeds. ^ Different alleles occupy the same locus on homologous chromosomes. 3.2 At each locus, a diploid organism possesses two alleles located on different homologous chromosomes. where the shape of seeds is determined. This locus might be occupied by an allele for round seeds or one for wrinkled seeds. We will use the term allele when referring to a specific version of a gene; we will use the term gene to refer more generally to any allele at a locus. The genotype is the set of alleles that an individual organism possesses. A diploid organism that possesses two identical alleles is homozygous for that locus. One that possesses two different alleles is heterozygous for the locus. Another important term is phenotype, which is the manifestation or appearance of a characteristic. A pheno-type can refer to any type of characteristic: physical, physiological, biochemical, or behavioral. Thus, the condition of having round seeds is a phenotype, a body weight of 50 kg is a phenotype, and having sickle-cell anemia is a pheno-type. In this book, the term characteristic or character refers to a general feature such as eye color; the term trait or phenotype refers to specific manifestations of that feature, such as blue or brown eyes. A given phenotype arises from a genotype that develops within a particular environment. The genotype determines the potential for development; it sets certain limits, or boundaries, on that development. How the phenotype develops within those limits is determined by the effects of other genes and environmental factors, and the balance between these influences varies from character to character. For some characters, the differences between phenotypes are determined largely by differences in genotype; in other words, the genetic limits for that phenotype are narrow. Seed shape in Mendel's peas is a good example of a characteristic for which the genetic limits are narrow and the phe-notypic differences are largely genetic. For other characters, environmental differences are more important; in this case, the limits imposed by the genotype are broad. The height that an oak tree reaches at maturity is a phenotype that is strongly influenced by environmental factors, such as the availability of water, sunlight, and nutrients. Nevertheless, the tree's genotype still imposes some limits on its height: an oak tree will never grow to be 300 m tall no matter how much sunlight, water, and fertilizer are provided. Thus, even the height of an oak tree is determined to some degree by genes. For many characteristics, both genes and environment are important in determining phenotypic differences. An obvious but important concept is that only the genotype is inherited. Although the phenotype is determined, at least to some extent, by genotype, organisms do not transmit their phenotypes to the next generation. The distinction between genotype and phenotype is one of the most important principles of modern genetics. The next section describes Mendel's careful observation of phenotypes through several generations of breeding experiments. These experiments allowed him to deduce not only the genotypes of the individual plants, but also the rules governing their inheritance. Each phenotype results from a genotype developing within a specific environment. The genotype, not the phenotype, is inherited. Mendel started with 34 varieties of peas and spent 2 years selecting those varieties that he would use in his experiments. He verified that each variety was genetically pure (homozygous for each of the traits that he chose to study) by growing the plants for two generations and confirming that all offspring were the same as their parents. He then carried out a number of crosses between the different varieties. 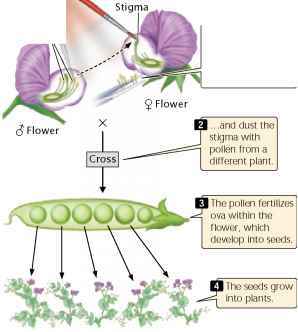 Although peas are normally self-fertilizing (each plant crosses with itself), Mendel conducted crosses between different plants by opening the buds before the anthers were fully developed, removing the anthers, and then dusting the stigma with pollen from a different plant. Mendel began by studying monohybrid crosses — those between parents that differed in a single characteristic. In one experiment, Mendel crossed a pea plant homozygous for round seeds with one that was homozygous for wrinkled seeds (Figure 3.3). This first generation of a cross is the P (parental) generation. 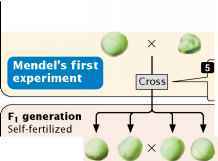 After crossing the two varieties in the P generation, Mendel observed the offspring that resulted from the cross. 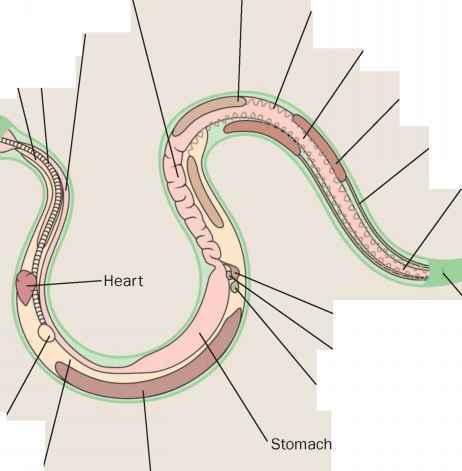 In regard to seed characteristics, such as seed shape, the phenotype develops as soon as the seed matures, because the seed traits are determined by the newly formed embryo within the seed. For characters associated with the plant itself, such as stem length, the phenotype doesn't develop until the plant grows from the seed; for these characters, Mendel had to wait until the following spring, plant the seeds, and then observe the phenotypes on the plants that germinated. Question: When peas with two different traits—round and wrinkled seeds—are crossed, will their progeny exhibit one of those traits, both of those traits, or a "blended" intermediate trait? Mendel crossed two homozygous varieties of peas. I All Ft seeds were round.